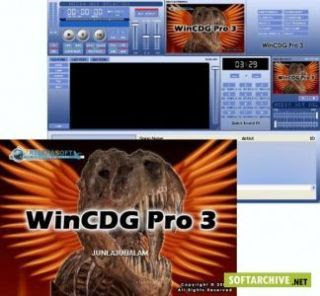 WinCDG Pro 3 is the rebirth of this classic line with support for the new operating systems (this includes Windows Vista). WinCDG Pro 3 can play karaoke, video, and audio. It will play CD+G and CD-Audio discs. It also includes the basic import (or "ripping") from CD+G to MP3+G. WinCDG Pro 3 continues to include the fast CD+G and MP3+G playback routines and the feature that first made is famous, the direct CD+G Disc playback. Have a look at the new features now included in this new release and enjoy the eclectic mix of the features carried from the original. Posted by TheStoneCrusher on Wed, 03/18/2009 - 18:01. If I am correct, there is no tutorial with WinCDG Pro 3, but . . . for $50/hour you can get online tutoring. Am I missing something . . . are they? Posted by andy t on Wed, 11/07/2007 - 23:39. My wife brought some dvd karaoke discs back from russia, she wants to play them on our karaoke machine, is there anyway of convwerting the vob files to cdg? Posted by WINKIE on Tue, 12/05/2006 - 19:07. Posted by Sharon Turner on Sat, 02/10/2007 - 17:56. 1. Use Audiograbber to rip a CDG disc to .KAR format files on your PC? 2. Use Audiograbber to rip a CD with Kar files on it to your HDD, still in KAR fromat? Then if you tried to play them back in Audiograbber....that would be your problem...cause it won't play KAR files. KAR files aren't even a supported format. Like MIDI files...they belong on Playschool...or for low grade samples or ditties in media advertising etc...yuck!!!! Get CDG files or discs....seriously!!!! Posted by mark on Mon, 11/27/2006 - 14:25. Posted by Convert CD+G on Mon, 10/30/2006 - 09:09. Posted by direct CD+G and VCD playback on Mon, 10/30/2006 - 09:11. Posted by joy on Thu, 02/23/2006 - 02:42.
i have a white shape that wont go ? Posted by joy on Fri, 02/24/2006 - 03:22.
: i have a white shape that wont go ? Posted by Cathy on Fri, 11/04/2005 - 16:04. How do I convert MP3's to CDG's to burn to disc and play in a karaoke machine. Posted by act123 on Wed, 12/28/2005 - 07:42.
: How do I convert MP3's to CDG's to burn to disc and play in a karaoke machine. Posted by Anonymous on Sun, 10/17/2010 - 18:40. 1. mp3gtoolz* Or a program like it. 2. cdrwin* Or a program like it. 3. a cd burner that can read cdg files. 1.If you don't know cdrwin will tell you if you burner can read cdg files. 2. If it can't their web site has a list of compatible burners or get a plextor all their burners read cdg files. files to their own folder. 4.I say copy cause mp3gtoolz will delete you mp3+g files after it has converted them into bin files. 5.Now open mp3gtoolz and select mp3+g to bin and select the folder you put your files in after it has completed. 6.Open cdrwin and click the square in the upper left corner. 7.A new window will open on the right hand side you will see a button that says load cue (in the folder you converted mp3gtoolz made you a cue file). 8.Point cdrwin to the folder you just converted and the cue file inside and hit ok.
9.You just told cdrwin where your files are a how you want to burn them. 10.Now just put a cdr in your burner and click on the cd with an arrow pointing to a burner. 11.Also mp3gtoolz made you a txt file that will tell you in what order cdrwin burned your files. Posted by Sharon Turner on Sat, 02/10/2007 - 18:13.
: : How do I convert MP3's to CDG's to burn to disc and play in a karaoke machine. Posted by ken on Sun, 05/27/2007 - 20:41.
: : : How do I convert MP3's to CDG's to burn to disc and play in a karaoke machine. Posted by antony on Wed, 01/04/2006 - 09:14. Posted by paul collins on Sun, 05/25/2008 - 11:40. Posted by Paul Agius on Sun, 01/06/2008 - 13:27. Posted by jim on Sat, 10/01/2005 - 02:57. Posted by Kinnie B on Wed, 10/05/2005 - 19:18.
:I will like to play my CD+G karoake on my computer. When ever I play, the music might play, but there is no lirics to sing along. Posted by Terry on Wed, 12/13/2006 - 01:51.
: :I will like to play my CD+G karoake on my computer. When ever I play, the music might play, but there is no lirics to sing along. Posted by neil parr on Mon, 10/09/2006 - 17:35. Posted by Diego on Thu, 09/29/2005 - 19:53. Posted by pedro on Tue, 07/18/2006 - 06:20. Posted by TONY on Fri, 05/06/2005 - 11:55. IS THERE A WAY I CAN CONVERT KMF FILES TO A CD+G/MP3+G FORMAT. Posted by Sharon Turner on Sat, 02/10/2007 - 18:16.
: IS THERE A WAY I CAN CONVERT KMF FILES TO A CD+G/MP3+G FORMAT. Posted by MIKE on Wed, 04/09/2008 - 14:32.
: : IS THERE A WAY I CAN CONVERT KMF FILES TO A CD+G/MP3+G FORMAT. Posted by Todd Benkelman (via moderator) on Wed, 06/30/2004 - 01:37. Posted by tojo on Sat, 06/19/2004 - 08:39. Posted by Pip Collins on Sun, 08/13/2006 - 17:56. Hello, I don't know whether or not you're fixed up yet, but here's how to do it. 1.Save the songlist as an M3U file from the program. 3. Choose the option "Delimited Text"
Posted by Karen Weston on Wed, 05/19/2004 - 11:46. Am I correct in saying that I ned to purhase wincdg pro2 before I can run any of my karaoke tracks on lap top? Can I purchase this software on disc and not just another download? Posted by bobby pillow on Mon, 08/29/2005 - 12:53.
: Am I correct in saying that I ned to purhase wincdg pro2 before I can run any of my karaoke tracks on lap top? : Can I purchase this software on disc and not just another download? Posted by Sharon Turner on Sat, 02/10/2007 - 18:31.
: : Am I correct in saying that I ned to purhase wincdg pro2 before I can run any of my karaoke tracks on lap top? : : Can I purchase this software on disc and not just another download? Noooo....there are many good CDG karaoke programs....each with it's pro's & cons. 1. Home or Show situation? 2. What format are the files you have on the PC or Laptop? 3. How many files do you have? 4. What features do you want..e.g. Pitch or Key change...flexible queueing...Kamikaze feature? I like the fact that you can play ZIP files with it....which will free up loads of HDD space for me...as I will delete all the MCG/MP3 files that I use now (MCG is CAVS own compressed format)....and I love the flexible queueing and the fact that the singers preferred Key is queued as well...and I love the "next singer" scrolling strip at the top of the TV..above the lyrics screen....which can be edited to suit your personal needs or taste!!! Don't get me wrong....CAVS stuff is great...as are other programs....and the 3rd party s/w is great too.....but I just like the S&D player...go to the website & check it out...loads more features!!! Posted by Jeff on Thu, 04/01/2004 - 02:49. All I want to do is play GD+Gs on my laptop. The music play but with no display. What am I doing wrong? Posted by Larry Tucker (via moderator) on Sun, 04/24/2005 - 00:35.
: All I want to do is play GD+Gs on my laptop. The music play but with no display. What am I doing wrong? Posted by Sharon Turner on Sat, 02/10/2007 - 18:36.
: : All I want to do is play GD+Gs on my laptop. The music play but with no display. What am I doing wrong? Do you mean actual CDG discs...or CDG/mp3 files on your Laptop? Posted by SHAUN on Fri, 09/26/2003 - 17:33. Hi, Has anyone got a copy of clone cd that they could e.mail me cheers Shaun. Posted by russell on Tue, 09/28/2004 - 10:11.
: Hi, Has anyone got a copy of clone cd that they could e.mail me cheers Shaun. Posted by thomas on Wed, 09/03/2003 - 06:47.
is there a sotware for pitch changing of cd+g files???????? Posted by Robb on Sun, 05/01/2005 - 10:53.
: is there a sotware for pitch changing of cd+g files???????? Posted by Betty on Thu, 04/10/2003 - 04:46.
i would like to be able to view, and listen to cdg and create them, how would i and what do i need to do this? please someone help me!! Posted by greg on Fri, 04/01/2005 - 13:00.
: i would like to be able to view, and listen to cdg and create them, how would i and what do i need to do this? please someone help me!! CANT RIP CDG WITH PLEXTOR? Posted by PAUL BOLTON on Wed, 12/11/2002 - 07:21. I AM HAVIN PROBLEMS I HAVE DOWNLOADED WINCDG DEMO BUT WHEN I GO TO RIP CDG DISC TO MP3CDG WONT RECOGNIZE MY PLEXTOR WRITER IT IS CDG COMPATIBUL BUT WHEN I OPEN WINCDG ITS NOT THERE ITS A PLEXTOR 24/10/40A ANY CLUES WOT TO DO? Re: CANT RIP CDG WITH PLEXTOR? Posted by Fat Willy on Wed, 03/12/2003 - 10:25.
: I AM HAVIN PROBLEMS I HAVE DOWNLOADED WINCDG DEMO BUT WHEN I GO TO RIP CDG DISC TO MP3CDG WONT RECOGNIZE MY PLEXTOR WRITER IT IS CDG COMPATIBUL BUT WHEN I OPEN WINCDG ITS NOT THERE ITS A PLEXTOR 24/10/40A ANY CLUES WOT TO DO? Posted by Sharon Turner on Sat, 02/10/2007 - 17:25.
: : I AM HAVIN PROBLEMS I HAVE DOWNLOADED WINCDG DEMO BUT WHEN I GO TO RIP CDG DISC TO MP3CDG WONT RECOGNIZE MY PLEXTOR WRITER IT IS CDG COMPATIBUL BUT WHEN I OPEN WINCDG ITS NOT THERE ITS A PLEXTOR 24/10/40A ANY CLUES WOT TO DO? Ohhhh...pleeeease!!!! Like you would have never done anything that is "naughty".....lOLOLOLLOLOLL....too funny!!! Posted by andrew on Thu, 05/15/2003 - 10:45. Posted by colin on Wed, 09/01/2004 - 21:45.
new plextor might not .but try plextor site to upgrade firmware.this may sort your drive out. Posted by Sharon Turner on Sat, 02/10/2007 - 17:23.
: new plextor might not .but try plextor site to upgrade firmware.this may sort your drive out. Save yourself the hassle....if you have a Plextor drive...download CDRWin 3.## and rip & burn your CDG's with that. But....you will need to read the instructions...THOROUGHLY!!! Posted by Andrea (via moderator) on Wed, 11/24/2004 - 06:44. Posted by Fred on Tue, 10/15/2002 - 22:59. How do you know if your cd rom is cdg compatible? Posted by lee on Sun, 10/24/2004 - 16:24.
: How do you know if your cd rom is cdg compatible?